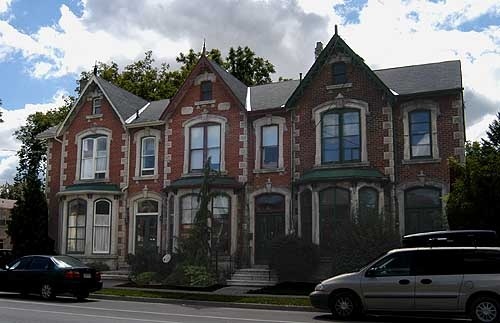 There were lots of different types of New York row houses, including those constructed in the Queen Anne style. Much like the Victorian Queen Anne style single-family homes, these rowhouses became fashionable in the 1880s and 1890s. They are characterized by their asymmetrical forms, front-facing gables, and use of contrasting materials, colors, and textures. Victorian Queen Anne New York Style Row Houses often have ornamental spindles, brackets, and other eccentric and fanciful details with Classical, Renaissance precedents and Romanesque Revival influences. They have a "whimsical juxtaposition" of window pane sizes, often pairing double-hung windows with a small paned upper sash. Three-sided projecting bay windows and and multi-paneled wooded doors are also typical features of QUeen Anne New York Row Houses. In the Summit University neighborhood of Saint Paul, there are excellent examples of the Victorian Queen Anne Style of New York Row House. Similar to the experience of Minneapolis but more dramatic, new listings for homes fell in Saint Paul, Minnesota, during the month of April, according to the Minneapolis Area Association of Realtors’ Market Update for 100 Twin Cities Communities. During April of 2008, there were 681 new listings in the City of Saint Paul. In April of 2007, there were 806 new listings, which is a drop of about 15.5%. That is very different from March 2008’s drop of just 4.1%. St. Paul’s Downtown experienced the greatest decline in new listings at -42.4%.